ANC, the ABS-CBN News Channel, continues to raise the level of discourse on global issues in the country by bringing one of the most influential women in history, to speak at the ANC Leadership Series this month. 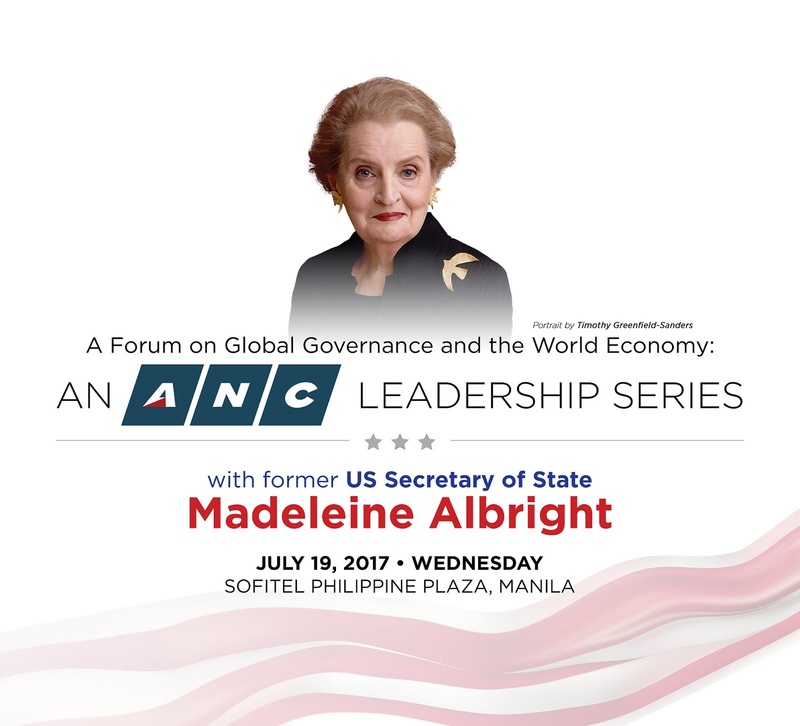 Former US Secretary of State Madeleine Albright is headlining ANC’s Forum on Global Governance & World Economy on July 19 at the Sofitel Philippine Plaza Manila in Pasay City. In 1997, Dr. Albright was named the first female Secretary of State and became, at that time, the highest-ranking woman in the history of the U.S. government. As Secretary of State, Dr. Albright reinforced America’s alliances, advocated for democracy and human rights, and promoted American trade, business, labor and environmental standards abroad. From 1993 to 1997, Dr. Albright served as the U.S. permanent representative to the United Nations and was a member of the President’s Cabinet. Today, Madeleine K. Albright is a Chair of Albright Stonebridge Group and Chair of Albright Capital Management, an affiliated investment advisory firm focused on emerging markets. Dr. Albright is a Professor in the Practice of Diplomacy at the Georgetown University School of Foreign Service, and she is the Chair of the National Democratic Institute. Dr. Albright is the author of five New York Times bestsellers. In July’s forum, which will be moderated by multi-awarded broadcast journalist Karen Davila, Dr. Albright will share her views on the worlds current dynamic political and economic situation. This is the second time that ANC is featuring a world-renowned speaker at the ANC Leadership Series. Last year, ANC brought in Virgin Group founder and philanthropist Sir Richard Branson, who shared his life story and business knowledge to a crowd of business leaders, celebrities, and professionals in the forum moderated by Cathy Yang. 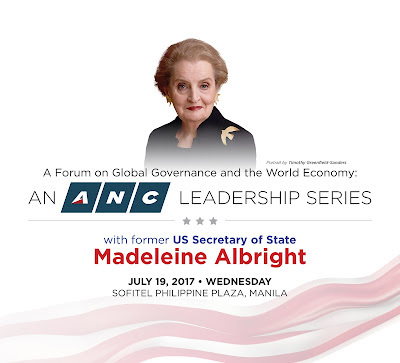 Tickets to “A Forum on Global Governance & World Economy: An ANC Leadership Series” featuring Madeleine Albright are priced at P35,000, P20,000, and P10,000. For inquiries and reservations, visit TicketNet or TicketWorld outlets or visit their websites at ticketnet.com.ph and ticketworld.com.ph. You may also call911-5555 (TicketNet) or 8919999 (TicketWorld). ANC, the first 24/7 all English news channel in the Philippines, is the go-to news source of the nation’s business leaders and decision makers. Apart from the ANC Leadership Series, ANC also holds the ANCX series, which serves as a venue for business leaders to gather and discuss the most important issues in the country and the world today.